The artwork develops an interactive dialogue with the activities on the street, and connects both disciplines of the School of Art and the School of Music at each end of the precinct. 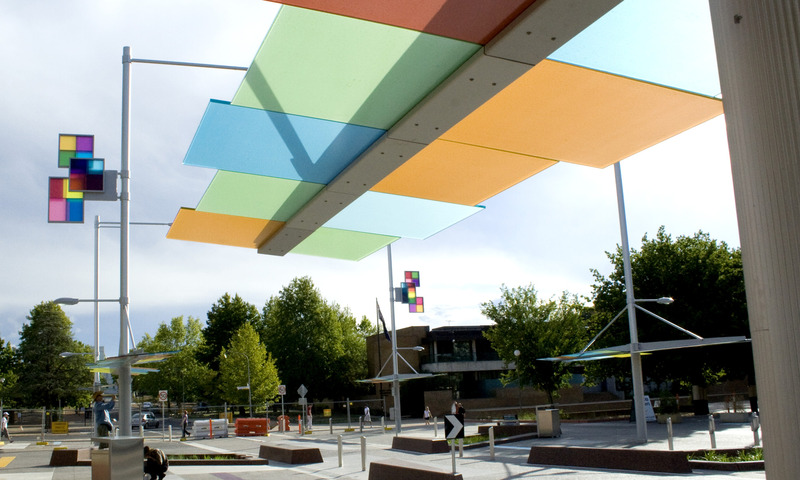 The artwork consists of sensors, sound and lighting spanning the Childers Street arts precinct. The work was commissioned by the ACT Planning and Land Authority. The artwork explores the concept of ‘synaesthesia’, a phenomenon in which the senses overlap, in this case blending hearing and sight. Sensors on each structure pick up localized ambient sounds, transforming them into moving light patterns displayed on vertically suspended coloured glass panels. Composer Alexander Scriabin’s ‘synaesthetic’ system of musical notation was used to determine the colour palette, and has also been used to translate Australian composer Percy Grainger’s Walking Tune onto the glass panels of the shelter structures.